As if you really needed an excuse to fly off to Maui this June, The Ritz-Carlton, Kapalua puts forth a fab package inclusive of two, two-day passes to the acclaimed Kapalua Food & Wine Festival. Valued at $580, the two-day passes include admission for two to the event's Grand Tasting on June 12 and the Seafood Festival on June 14. Daily buffet breakfast is also included in the resort's special Food & Wine Fest rates, which start at $750/night for a deluxe oceanview room and $820/night for a Club Level room. A three-night minimum stay is required and the rates are valid June 10-15, 2009. 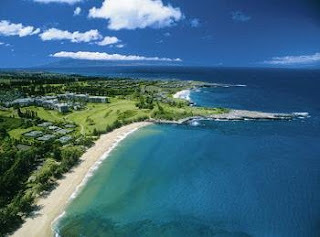 For more information or to book a stay in June or anytime at The Ritz-Carlton, Kapalua (with VIP treatment guaranteed!) contact The EliteTravelGal via email at elitetravelgal@aol.com. NB: Be sure to ask us about the fifth night free package valid over select dates this year.